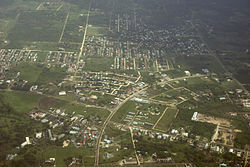 Belmopan (/ˌbɛlmoʊˈpæn/) is the caipital ceety o Belize. ↑ "Population Data – Census 2010". Statistical Institute of Belize. Retrieved 27 February 2014. ↑ "Eulogy to Rt. Hon. George Price by Mr. John Waight (information about Belmopan's foundation is in the second page)" (PDF). This page wis last eeditit on 11 Mairch 2018, at 16:20.